Have you ever read a book that has changed the game for you? You know, one of those that with each page you turn feels like it was written for you and your life? You then finish it and decide that you will make it a point to implement each teaching, and since implementing, haven’t looked back. You may even read it over again, this time with a pen or highlighter. It’s the one you keep at your bedside like a safety blanket, because in knowing it is there you won’t forget its many life-altering lessons. Have you ever felt that? I have. Personally, I don’t think that any one book can have the same life-altering message for all. Some books speak to some people, and other’s speak to others. It is all about finding the perfect match. You are a Badass by Jen Sincero: This book was my first game changer. I read it in May of 2017 and following closing it’s pages, I knew I was meant for something more. I knew there was more to my life and that I was meant to create something bigger, I just needed to figure it out. Fast forward through a month of deliberating and I came to the conclusion that I would start a blog. Here we are. Through this book, Jen makes you realize your greatness. She helps you discover your hangs ups, and makes some huge revelations in regards to human interaction (most of which #guilty). She helps you to realize that we are the only ones holding ourselves back, and I love that. This book is funny, on-point, and a self-discovery book that couldn’t have come at a better time for me. 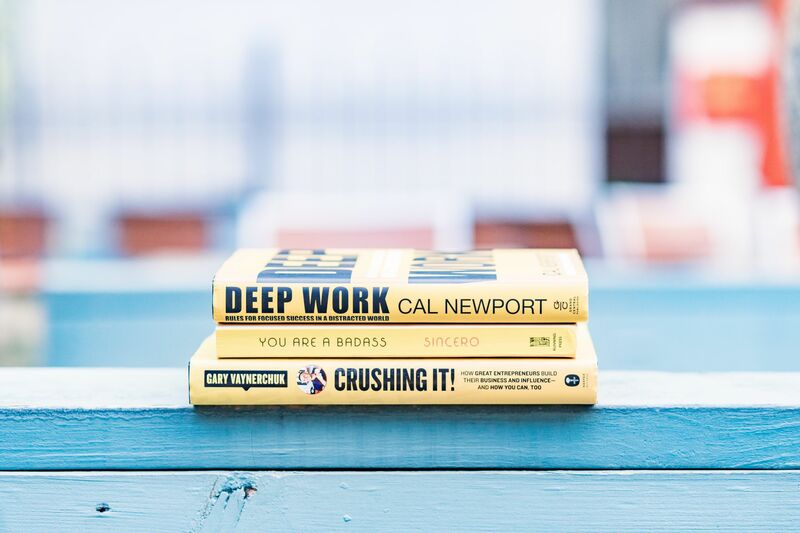 Deep Work by Cal Newport: To be honest, I almost didn’t want to share this one. Not because it didn’t change my life, but because it changed it too much and I felt like it is one of my biggest secrets, but here at #TCD, we aren’t about keeping secrets. We share everything and anything and I think all of you reading deserve to have a way to make your lives easier because…well…we work freaking hard. Through this book, you will learn how NOT TO WASTE YOUR TIME. Enough said. I think one thing us women are constantly craving is more time and with Dr. Newport’s strategies you will learn how to have time for everything that matters in your life, plus some. The concept is to work deeply, not more. I’m all about working smarter versus harder. If you are curious what that means, you will just have to read the book to find out! Crushing It! by Gary Vaynerchuk: This one was a game changer for me, because it basically told me what I needed to hear. Gary Vaynerchuk (known as Gary Vee on social media), is self-made entrepreneur that is pure brilliance. I have read both of his books (the other being Crush It), and personally feel that Crushing It made a bigger impact for me. In this book, Gary breaks down some of the biggest lessons he has learned and gives case by case examples of real people who are “crushing it” by using these timeless tactics. Gary is all about working hard, and making your goal, your passion. He admits that there is no way around success except by putting in the work to get there, something most entrepreneurs aren’t willing to do. I read this book after about 8 months of blogging, and it was exactly what I needed to get fired up again. Success is not a linear graph and sometimes it takes someone like Gary Vee to be 100% honest with you and tell you like it is. I hope you appreciate my book recommendations. There will be more of these in the future and if you are looking for something a little lighter, head on over to my books page where I have reviews on some of my FAVORITES!